Elivi Varga studied music at Goucher College, the Liszt Academy of Music in Budapest, Illinois State University, and the University of Illinois at Urbana-Champaign, where she earned a Doctorate of Musical Arts. Elivi’s newly released CD Silver Tunes: Music For Flute and Organ includes world-premiere recordings of music by Lowell Liebermann and Augusta Read Thomas. 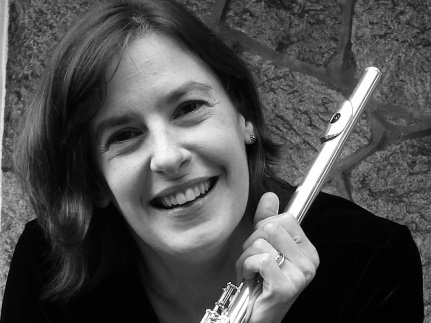 Elivi has performed with the Illinois Symphony Orchestra, Baton Rouge Symphony Orchestra, Acadiana Symphony Orchestra, and the Louisiana Sinfonietta, and is currently principal flute of the Philadelphia Wind Symphony. She has taught music at Illinois State University, Southeastern Louisiana University, Alvernia University, Community College of Philadelphia, Illinois Summer Youth Music, Camp Batawagama, Darlington Arts Center, and at Settlement Music School. Elivi is also active as a clinician, adjudicator, and a book reviewer for the Philadelphia Inquirer. When not playing her flute or teaching, Elivi enjoys cooking, reading, and running in Wissahickon Creek Park.